In my career, I have come across people who – being offered the role of a manager – were hesitant to accept the challenge. Some of them refused immediately and decided to stay in a role of an individual contributor, building up their expertise and specialization without managing others. Some took the offer and became successful managers. Yet, there were also those who spent some time in management roles and then returned to individual contributors’ roles. Have you, as a manager, ever seen a great potential for leading others in somebody who kept declining the offer to promotion? Have you yourself became a manager after being persuaded by your superiors without ever before imagining this career path for yourself? He had experienced Jan helping others succeed and guiding junior developers to get things done as well as to understand company culture better. Carl had observed how influential Jan could be across the company and how effectively he resolved conflicts between teams. And Carl knew well that these were the behaviors he wanted to see in a manager. Carl asked me back then, “Do you think Jan would be unhappy as a manager, or do you think he is only afraid he might fail?” I advised Carl to ask Jan why he did not see himself as a manager and suggested Carl explain to Jan specific situations that made him think Jan would make a great manager. During their conversation, Carl discovered Jan felt too junior for the management role and was afraid of losing touch with the technical part of his job that he enjoyed. Jan was afraid he would not be happy if he was to work through others. As Jan had no direct experience with what a management role looked like, they finally agreed that without being promoted yet, Jan would gradually be assigned more and more team lead’s responsibilities while Carl coached and supported him along the way. After a couple of months, they evaluated the situation, and Jan realized that he actually enjoyed his new leadership role and agreed to the promotion. Not everybody wants to level-up to the role of a manager, and not every attempt to step into the new role is successful as in Jan’s case. If you are unsure whether the management path is the right choice for you, you can use the questions in the first column of the table below to help you decide if the management role could possibly become your sweet spot. You can use the same questions to explore with your subordinates how comfortable they might feel in the management role. I also added open-ended questions in the second column for you to use during the behavioral interview with candidates for management roles from the inside or the outside to evaluate if they are good fits. I strongly believe that one cannot become a good manager if his answer to most of the questions in the first column is “no” and the main reason why he applies for the management job is to get control, power, social status, or a raise in salary. There are several indicators you, your team member, or a candidate for the management role should avoid management: you are frustrated by mistakes of others, you think there is only one correct way to do things, you desire to get the management role only to get a salary raise, or you want to make things right by installing order through power and enforcing rules. On the other hand, if you’d like to become a manager and answered “yes” to most of the questions in the first column, even if no one’s offered you a management role yet, take charge and do all those things that make you happy now! 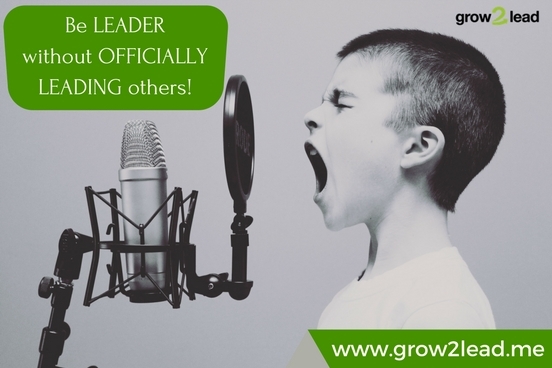 Be leader without officially leading others! True leaders become leaders before having the title. They don’t need the role to be influential. Try it and see. Sooner or later, you might be offered the formal leadership role by somebody who has noticed your leadership skills in daily observations of your actions. And, if you need help with decision making or becoming a leader, whatever that means to you, ask for 20 minutes of free online coaching now. has a Ph.D. in psychology and has been working as a leadership coach and trainer as well as leading teams in the Czech Republic, India, USA and Ireland for more than 10 years. Her long-lasting passion is helping first time managers succeed quickly in their new roles and grow into strong leaders. She lives in the Czech Republic, but travels and works worldwide, thanks to the digital age. You can read more about her at www.grow2lead.me.